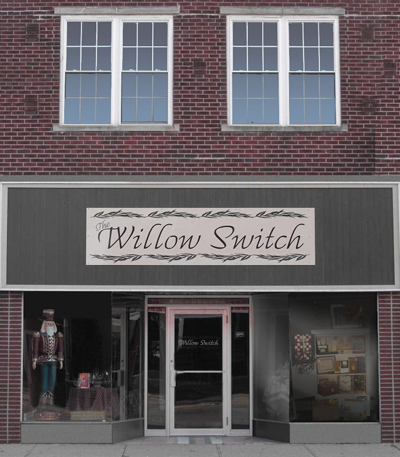 The Willow Switch™ offers customers a unique shopping experience conveniently located in downtown Rensselaer, Indiana. The Willow Switch™ is the place to go for a unique selection of home decor, great gifts, and the best coffee in town! Owned and operated by myself and husband, Christy and Tom Fleming, The Willow Switch first became an idea in August 2005. Having lived in Rensselaer, Indiana, most of our lives, we decided to test the market with my interest in primitive style decor by renting booth space from a local flea market and craft mall. In February 2006 we had the opportunity to purchase a building in downtown Rensselaer. As we continued to research products and grow a customer base, our new building was remodeled and rented. It wasn't until November 2009 that The Willow Switch opened it's doors in a storefront of it's very own. During a time of economic decline, we opened on a lot of FAITH, and a little diversity. Not only did we want to offer home decor representing a simpler time, but also a retreat for our friends and customers to slow down and regroup from the "daily grind". With this brought the idea for a gourmet coffee and tea bar. Our goal here is to offer exceptional quality coffee and gourmet drinks without the franchise pricetag! Although we do not have espresso based drinks, we have some really good recipies that measure up to great taste as similar products. It is truly a priviledge, and with great joy, that we can share a place of refuge for others to enjoy beautiful gifts, decorations for your home, soothing music, fresh great-tasting drinks, and peaceful moments. We are blessed to be able to share this with all of you. The goal was quite simple... to surround ourselves with the things we love, and share it with other people!